AKIPRESS.COM - Two people on a motorbike have carried out a suicide bombing at a police HQ in Surabaya, a day after a wave of deadly blasts in the Indonesian city, BBCreported. Police officers were injured in the explosion, which occurred at 08:50 local time (01:50 GMT), but the extent of casualties was not immediately clear. At least 13 people were killed in bomb attacks on three churches on Sunday. The Islamic State group has said it was behind those attacks. Indonesian President Joko Widodo described the string of attacks as "cowardly, undignified and inhumane". "There will be no compromise in taking action on the ground to stop terrorism." It was not yet clear whether the attacks were connected to deadly blasts on Sunday. 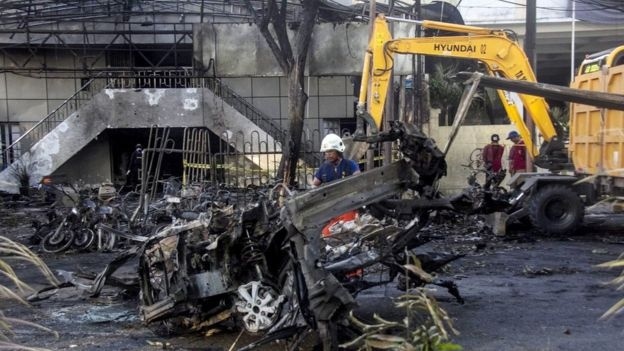 East Java police spokesman Frans Barung Mangera said full details could not be given yet "because we are still identifying victims at the scene and the crime scene is being handled".